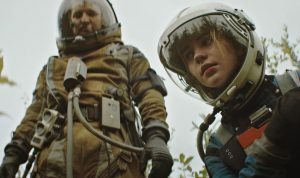 I met with directors Chris Caldwell and Zeek Earl, of the new science-fiction feature Prospect (which I also reviewed), on Sunday, March 11, at the 2018 SXSW Film Festival. The film, an adaptation of a short film the team produced in 2014, is a marvel of cinematic ingenuity, achieving spectacular storytelling results through a combination of an inventive script, solid performances and evocative sound design. We follow the harrowing adventures of a group of intergalactic miners in search of a mysterious mineral called “aurelac” on a planet covered with human-unfriendly air. Desperate to survive, they turn on each other. Newcomer Sophie Thatcher stars alongside veteran indie and TV actors Jay Duplass (Landline), Pedro Pascal (Javier Peña on Netflix’s Narcos), Anwan Glover (Desiree), Andre Royo (Hunter Gatherer) and Sheila Vand (A Girl Walks Home Alone at Night). Here is a condensed digest of our conversation, edited for clarity. Hammer to Nail: So, how did you guys meet and start working together? Zeek Earl: We went to college together, in Seattle. We were both in a creative-writing program. We didn’t go to film school. So we were just college friends. We watched movies together, we binged The Wire together. HtN: I’m from Baltimore, just so you know. That’s where I teach. Chris Caldwell: And we were able to get two guys from that series in our movie: Slim Charles and Bubbles. That was surreal! HtN: That explains why you cast them, then. Didn’t realize you were fans of The Wire. ZE: Yeah! So, we graduated during the recession, and kind of banded together, making ads, on our own, and that turned into our own company. We always had ambitions to get into filmmaking, so we used that commercial production experience – that was kind of our film school – to start making movies. HtN: But always staying in the Pacific Northwest. ZE: Yeah. We went to college in Seattle and live there now. HtN: So, have you decided to make that the Hollywood of the Northwest? CC: I think so. It wasn’t like a vehement opposition to interacting with Hollywood, or anything, it’s just kind of where we were, and we were able to make our own films and never found any reason to leave. And once our shorts started coming out, we were getting a lot of of really excited responses, because with a lot of the shorts that are coming out L.A., people are shooting in the same locations, and for us, we were trying to do something that was really visually distinctive, with new landscapes. I mean, the Hoh Rainforest, in Washington’s Olympic Peninsula – which is our “Green Moon” forest – where we shot both the short version of Prospect and the feature, is so distinctive, and we just love it. HtN: Yes, it does give it a distinctive feel. So, speaking of the short, could you discuss what made you want to adapt it to a feature. Had you always intended it as a calling card for a feature? And, no plot spoilers here, but the feature is quite different than the short, with only the basic premise the same, so what motivated your choices in the actual adaptation? CC: For Prospect, we did intend for it to be a feature. Our first short film, In the Pines, we made without any such foresight. We just wanted to make a short film and made a short film, and then were blown away when we got accepted into SXSW, and it kind of opened everything up. We very quickly realized that you want to have a plan for the future if you’re going to come to a festival with a short film. And so Prospect was definitely more intentional, where we were laying the groundwork for a world, for a tone, for setting and for characters, and yeah, the feature definitely expands into territory that is not represented in the short film, at all. Still, the building blocks were there. I think a lot of the conceptual and aesthetic foundations for the world were there. One of the things that we really wanted to do was create an immersive, original universe. And that takes time. So, essentially, the way we see it, since we started developing the short film, in 2012, we’ve been continuously developing this universe, all the way up until the feature. It’s been basically a six-year process. HtN: So, you talked about how much you liked The Wire, which is where you found two of your stars, so let’s talk about casting, in general. This is your first feature. You were known only for your shorts and for your commercial work. How did you go about getting the script to Jay Duplass, or the heretofore unknown Sophie Thatcher, or people like Sheila Vand, Pedro Pascal, etc? CC: Well, we have our producers, Depth of Field – led by Chris Weitz, Andrew Miano and Dan Balgoyen – and they were instrumental in allowing us to stay in Seattle, because we had people that were advocating for us in Los Angeles who had more connections than we did, along with our agents at WME. So that was the path for the script. But also, as a first-time director, I still don’t know how we got the cast that we got. ZE: For Sheila, similarly to The Wire, we were big fans of her work, and sought her out. HtN: I’ve only seen her in A Girl Walks Home Alone at Night, but that would have been enough for me. ZE: Exactly! And similarly with Sheila, Jay, Anwon and Andre, these were kind of people we just wanted to hang out with. And obviously, they were a good fit for the movie and a good fit for the universe, but there was definitely some kind of personal ambition in the casting, as well. CC: For sure. With Sheila, Anwon and Andre, in particular, we just went directly to them. We offered them the parts, because we knew we wanted them. For Sophie, she’s a discovery, and it was a nationwide casting search, with us watching lots and lots of tapes. She was one of the first tapes we saw, and no one ever topped her. HtN: Well, she’s great. So, since it was the producers who helped you get the script to some of these people, the question then becomes, how did you find them? Through the film-festival circuit? ZE: I mean, yeah. I’d say that we’re really big advocates of the idea that if you make a short film, it’s great to take it to film festivals, but for us, it’s always been more important to get it online, to get it in front of as many eyeballs as possible. Because even though SXSW is a great festival, it was still Prospect‘s online release that really got the attention of Hollywood. And so, Dan Balgoyen – one of Chris Weitz’s partners – found the short and reached out, and so did a lot of other people. So, we had a trip to Hollywood based on the short’s online release, and made those connections. CC: Yeah, I think there are different strategies, and even when we were at SXSW last time with the short, we were talking to the other shorts filmmakers, and we had already intended, as soon as we were done with SXSW, to put the film online. And a lot of people were confused by that, because people want to do their festival run and try to accrue as many laurels as possible, and we had tried to do that with In the Pines, but it was soon as we put Prospect online that things started happening. ZE: Well, I don’t want to undermine being at SXSW, because that is absolutely huge, and kind of the first step. It’s like, having a reputable festival then allows you to reach out to outlets who will then promote it. CC: Yes. At SXSW, people from Vimeo were able to see it, and we were able to be chosen as a “staff pick,” which is huge. ZE: The Verge actually released it, exclusively, so there was an outlet behind it. HtN: Got it. That makes sense. And I’ve seen the short. It’s 13 minutes long, and really brilliant in the complexity of its storytelling in that brief time, so I can see it making a big splash. So, let’s talk, then about your choice of location of the Hoh Rainforest, which I like, because it’s eerie and familiar at the same time. In fact, that would be one way to describe the production design of your movie, in general. We’re on a planet where they cannot breathe the air, but, simultaneously, we’ve got insects, trees, plants…the planet can’t be so different from ours. What then, first drew you to the Hoh Rainforest? ZE: The Hoh is a very personal location. We’re both Northwest natives; we grew up backpacking and hiking. The first time I went on a camping trip in the Hoh Rainforest, it just captivated my imagination. The actual shooting location is a place, over the years of shooting and story development, where I would just camp and hang out and wander around. So, when it came time to shoot, there were very specific locations, and trees, where I had something framed in my mind around that place, or that tree. And I would have what just looks like a swath of forest mapped out in my mind. CC: Yeah, one of the things I am most proud of, in our scouting, was that we created a whole system of nomenclature for individual spots in the forest. Most people in the crew knew it, so we were just spouting off all this lingo, and it was just super fun to just know this track of land so intimately. ZE: Aside from my backyard, I don’t know anywhere else as well as this square mile in which we shot the movie. HtN: So, you clearly thought this through. How deep, then, does your world-building of this planet go? Does it have a name? I don’t remember. CC: The common-usage name is the Green Moon, and that’s how they talk about it in the film. HtN: Sorry, I guess I missed that. CC: The moon’s name is Bachroma Green, because Bachroma is the name of the gas giant, around which there are several moons. HtN: Got it. So, how deep does it all go? Did you think about what the air consists of? Or how this vegetation, which looks so similar to Earth’s, but can’t be breathing the same carbon dioxide, works? And what the hell is aurelac? ZE: Aurelac is like an oyster. Like an earth oyster, in the ground. We wanted something that was disgusting and slimy, from which this beautiful thing emerges, but it was also important to us that it’s completely useless. It has no special powers. It’s just this shiny thing on this faraway moon that people go risk their lives to get. CC: And that was kind of the thematic foundation for the film: working-class people putting their lives on the line for a luxury economy that is essentially meaningless. But yeah, depth of world was something that was hugely important to us. ZE: When we were developing the script, we kind of started making our own Wikipedia, so even for characters that you see only briefly, we wrote whole backstories, including how they got there, and what their home planet is like, and what their culture is like. We have a whole thought process about the governmental systems that you never see. CC: That’s what happens when you grow up on Star Wars visual encyclopedias. HtN: Well, it’s pretty impressive, is all I will say. Congrats on the film!